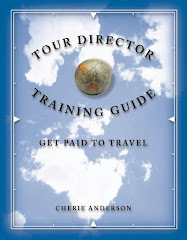 Why Ask a Tour Professional? Sometimes you have to return to favorite regions to verify if there are any changes. Local tour professionals are wonderful resources who may know about changes or they may even visit for you. One place I recommend along the coast, and you will find this is in many guidebooks, is to stop at Gayle's Bakery in Capitola-by-the-sea (5-10 minutes south of Santa Cruz). I stop to get a small snack-to-go of delicious items from desserts to breads (a fave is the Garlic Cheese Stick). You may also pick from yummy entrees, salads, and sandwiches. On weekends, it is crowded, they work quickly to assist everyone. I enjoy browsing their daily specials and desserts if there is a wait. There is a sunny patio available to eat or you may take the food with you for munchies while you are relaxing next to the beach, watching the surfers, or on picnic during hikes. I always take some home with me to enjoy later (or back to my hotel). It is definitely a great stop and still really delicious food. Remember to explore Capitola too. I always stop and buy saltwater taffy on the Santa Cruz Wharf next to Santa Cruz Boardwalk. The restaurants have delicious fried artichokes which are great with a cold mug of beer. If you have minimum time, one "show" I recommend is to park your car along West Cliff Drive by the Lighthouse - Surf Museum and watch the surfers. There are usually surfers everyday and sometimes you catch some great views. It is free to watch these experts. I had fun getting acquainted with couple traveling from the east coast who were in town (San Francisco) for their daughter's sporting activity and exploring Northern California. I love to hear the stories of their days trips and experiences! And, I shared tips and stories with them which validated their own great experience on their journey. More new friends! We sometimes take for granted the fabulous surroundings around us, while we get so focused on our daily activities. Do you like this article? Please comment below, share with your friends. Click over to our side bar for goodies too. Sometimes you go out for adventure and don't always get the expected results. Yet the adventure is successful. Why is this? I went to a casual lunch yesterday with an group of Work from Home Consultants (of assorted professions) to a great restaurant in Campbell. It is not a new restaurant, as the restaurant story started in 1994 (as stated on their website). And, the restaurant has different locations in Willow Glen, Blossom Valley and with Cupertino opening this month (March 2010). When I browsed their menu online, many of their creations are unique, organic, and cater to diets like the 'gluten-free'. The restaurant is very accessible in downtown Campbell, with good amount of seating, and with the Saddle Bar (with Margaritas and Sangria) connected to it. Check their website for the awesome personal story behind opening the Saddle Bar. It is a self-service restaurant where you order your own choice. They do have the daily special entrees available to pick from. A variety of different salsas and sauces to choose is near where you pick up your entree. The special entrees are more expensive, there are affordable smaller choices - depending on your tastes. A couple of us ordered the Monday special, Spinach & Artichokes Enchilada with Polenta, and neither of us had the particular taste for it. We agreed that it must have been the spice used in it. We do (very much) want to return and try the many other menu items. The burrito and tacos were very tasty. The environment was casual and active - although you could linger at your table after lunch if you wanted too. Additionally, this was a successful lunch adventure, and fun to try new taste items. During the warmer weather, there is seating at outside tables. And, the Aqui Cali-Mex is open on weekends - I look forward to try some of their weekend menu tastes. Try it! Aqui Cali-Mex, Downtown Campbell, on the main street, 201 E. Campbell Ave, (408) 374-2784 A great bistro - for something a little different.